Looking at the BFBS website I noticed that some Sky Sports channels are transmitted as well as BT Sports. How is that done bearing the transmission and licensing rights? Channels transmitted by recognised forces networks are treated as 'domestic' for rights purposes. In addition these channels are designed to be received 'on base' with minimal overspill too. Any player devices as well are carefully licensed to individuals who are contractually entitled to them. As the services are encrypted and only intended for the forces, it's not really a problem. I believe technically providers could charge a fee, but waive it. There have been rare interventions from local rights holders in the past when the signal was transmitted unencrypted on low power transmitters. But generally everything is encrypted these days, particularly where there could be overspill. Also nowadays rather than BFBS1 & 2, they just rebroadcast BBC 1, 2 and ITV, so they would all have similar rights issues to BT Sport etc. Yeah they changed their encryption to something more super secure, its essentially broadcasting what we get here with a BFBS logo and its low quality SD like Sky but it does the job, better then when they first started when they were flying tapes over from Wembley. So there is delayed and non-delayed versions. Interesting. BBC Two from BFBS is a special version of the channel, with children's programmes until around 18:00 UK time, after which the main BBC Two schedule is simulcast. 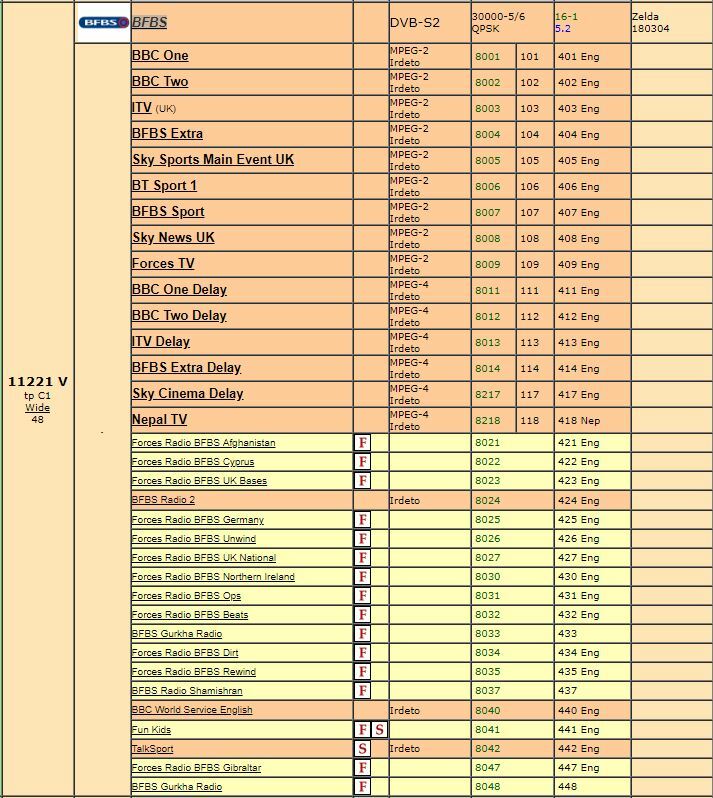 Also not all DTH users receiving the Eutelsat 10 signal get the delayed versions of the channels. They are not available on the EPG in Germany and Gibraltar. Do they get the channels in SD only? The delayed versions are MPEG4 according to that information, so are they in HD seeing as it's an HD capable (S2) transponder? Far too little bandwidth for HD. Likely in MPEG4/AVC to enable all the channels to fit on one transponder.